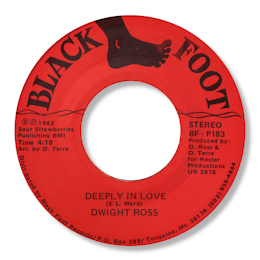 Mississippian Dwight T Ross was a multi-talented artist – a fine songwriter, expert pianist and a very soulful singer. He walked the line between blues and soul throughout his career and although the former genre is the one he is best remembered for these days he made some strong southern soul as well. 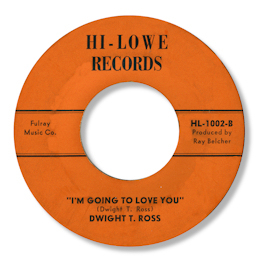 The earliest 45 I know from Ross is the rare one for Ray Belcher’s tiny Hi-Lowe concern. His own I’m Gonna Love You starts off with Ross’ swirling organ over which he gives a very fine performance, his voice cracking with emotion, helped by a very gospel sounding male chorus. 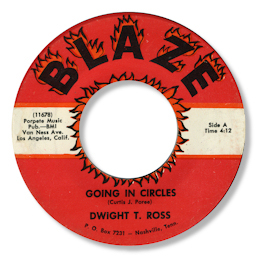 His second for the equally small Blaze label (another Ray Belcher owned brand) is very similar in approach – indeed so alike are the two discs that it’s probable they were cut at the same sessions. Going In Circles is a lovely minor keyed bluesy ballad on which once again Dwight’s organ is well to the fore and his vocal is if anything even more desperate so gruff and hoarse is his tone. More great vocal support from the male group. Belcher recorded a couple of gospel groups and I'd bet that the group in the background to these cuts was one of them moonlighting. In the 70s Ross recorded some demos at Malaco but nothing came of his audition and from the early 80s for about a decade Ross ran his own Black Foot label, recording other artists like Louise Bryant and J L Smith sadly without real success. But he recorded many good tracks on himself at this time. 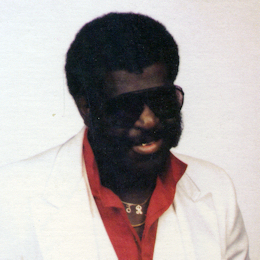 Versions of soul classics like “When Something Is Wrong With My Baby” and “Nothing Takes The Place Of You” mingled with his take on blues standards like Jimmy Reed’s “Bright Lights Big City” and Roosevelt Sykes’ “Driving Wheel”. Not surprisingly he made tracks in a more modern style like the groovers “Keep On Moving” and “Shake It Baby”. But for me the best songs he recorded during this period were Tommy Tate’s excellent blues “I’m On A Fixed Income” from 1992 and his own heartfelt ballad “You’re The Best Thing That God Let Live” but unfortunately Ross had a bad bout of the synths in the arrangements which rather spoil the effects for me. Much more to my taste is Deeply In Love from 1982 which had a highly memorable hook and on which the synths were much more restrained. Ross gives a strong vocal here even if the grit that characterised his earlier work isn’t so prominent. Ross brought many of these self-produced cuts together on his “Ross 1” LP in 1986 which had a Tougaloo, MS address. John Abbey picked up the album for his Ichiban concern a year later ensuring a much wider distribution. Although he retained the “Ross 1” title there were major changes in the tracks, not always for the better. But one very good cut, Vasti Jackson and Calvin Buie’s My Dreams Came True was introduced, and on this strong southern soul offering Ross sounded more committed and gruff toned than he had for some time. The use of real horns mixed in with the synths undoubtedly helped. At the end of the 90s and into this century Ross continued in the music business playing gigs throughout the south and at blues festivals. Sadly he is no longer with us. Disco fever / ?? ~ BLACK FOOT ?? Thanks to Pete Nickols for the suggestion and to Garry Cape for extra info.